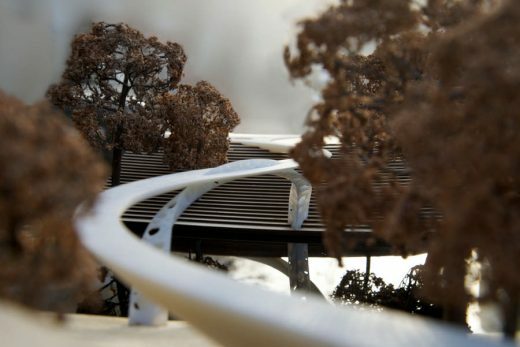 Architecture competition-winning proposals by Tonkin Liu for a new footbridge in Salford delayed due to a lack of funds, reports the Architect’s Journal. However, a planning application for this River Irwell crossing will not progress until further funds are received. Some initial Section 106 funds have been secured by Salford City Council. The design competition attracted 172 submissions from 31 countries. Cezary Bednarski criticised the architecture contest as a ‘waste of effort and money’, and an ‘example of how not’ to run a contest in 2013. 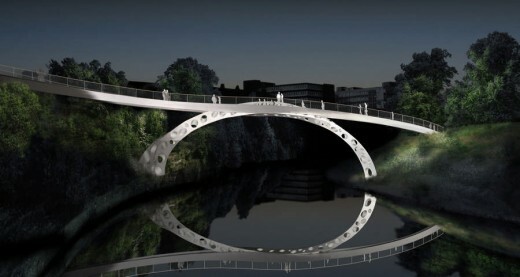 Salford City Council and the Royal Institute of British Architects (RIBA) have announced the winners of a proposed new pedestrian bridge across the River Irwell. Tonkin Liu with Arup fought off a strong shortlist which included Atelier Zündel Cristea, Paris; Mott MacDonald with Moxon Architects, Altrincham and London and Wolfgang Buttress Studio with Toby Savage Design Limited and LDA Design, Stockport. The site for the new bridge – The Meadows – covers around seven hectares and forms the northern section of the Irwell River Park (IRP) project. The proposed new bridge will play a crucial role in connecting this important site to the £650 million redevelopment of Salford Central including Chapel Street, which has recently undergone an award-winning £10 million transformation, the University of Salford, and the historic Peel Park. Salford City Mayor Ian Stewart said: “The winner’s entry clearly stood out for its bold design. It could become an iconic centrepiece for the area. Mike Tonkin of Tonkin Liu commented on their win “We are very excited about taking forward our project on this beautiful site, a place-making project that encompasses architecture, landscape and cutting-edge engineering. Date: 14th October 2013 – The structural strategy of Avery Associates Architectsʼ proposal for the Salford Meadows Bridge takes its inspiration from one of natureʼs structural solutions: the stem of a palm leaf. The great structural strength and integral sculptural beauty of this cross section is set within the geometric purity of an equilateral triangle. From the wide entrance on the main road, the bridge invites pedestrians in, offering a platform from which to contemplate the Meadow spreading out below and the anticipation of the journey towards it. The bridge provides a generous promenade, leaving the hum of the road behind and ramping gently down, over the river into the foliage of the Meadows. Protruding through the trees, visitors arrive at the main viewing and orientation deck, from which point they can begin their perambulation across the Meadows. Two arms of mounded grass embrace the landscape and define this corner as a special place of arrival and event. A path runs down along their top at a shallow angle, while two sets of stone steps provide a more direct route and the slope of the banks offer a place to sit and enjoy the activity beneath or to take a rest after a long walk. The power of the landscaping is in its simplicity and the beauty of the riverʼs natural curves. Following the shape of the river and footpaths, the banks form a space in which a comprehensive programme of further routes, events and landmarks could develop. Initiated at the outset, this on-going development would embed the Meadows into a sustainable future as a crucial part of Salford and the Irwell River Park. 11 October 2013 – It’s g’day, ¡hola, namaste, and ni hao to Salford as architects in a record-breaking 31 countries around the world submit their plans to build a new bridge in the city. 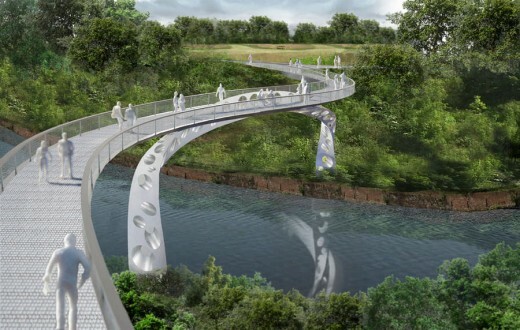 Overall, the competition received 172 submissions from 31 countries, as the city council looks to finalise plans to build a new pedestrian bridge across the River Irwell. Architects and engineers from as far afield as China, Australia, Chile, and India, came forward with a range of different designs, and have now been whittled down to just four. The competition – held jointly by Salford City Council and the Royal Institute of British Architects (RIBA) – looks to open up the untapped green space at the Meadows to local residents and students. The site for the new bridge – The Meadows – covers around seven hectares and forms the northern section of the Irwell River Park (IRP) project. IRP is set to be an international destination involving a partnership between Salford, Manchester and Trafford councils and will be the catalyst for major economic expansion in the area. The bridge is the next step in the IRP project, and is expected to be an iconic creation linking The Crescent (A6) with The Meadows. IRP will be an international waterfront destination. The project, involving a partnership between Salford, Manchester and Trafford councils, will be the catalyst for major economic expansion in the area as it seeks to link up £3 billion of investment through greater use of the River Irwell and the Manchester Ship Canal. And three new bridges have already been built across the Irwell and the Manchester Ship Canal, as part of plans to improve direct connections at key sites across Salford such as MediaCityUK and Greengate, alongside a bridge link to Manchester at Spinningfields. The Judging Panel included Renato Benedetti, McDowell + Benedetti acting as the RIBA Adviser, and Salford City Mayor Ian Stewart. The City Mayor said: “The amount of entries we had and the range of countries they were from is a testament to Salford’s reputation as a modern global city. “Professionals from around the world want to make a contribution to Salford’s growth. “The entries we have chosen are truly visionary for what they could offer to Salford. The bridge we hope to build here will be a crucial part of the area’s future. “Huge investment is going into Salford Central and the Chapel Street area – an iconic bridge with a global reputation will sit perfectly with that.” Renato Benedetti: “We were overwhelmed with the quantity and quality of the submissions received, especially with the international nature of the response and the wide variety of approaches taken. “This made our job as Judging Panel members more interesting and challenging and the four selected schemes are certainly worthy examples of Salford City Council’s aspirations for the project and the wider urban context.” The shortlisted teams will now meet the full judging panel at a final interview in November after which an overall winner will be selected. The Meadow, Salford is protected naturally by Irwell River from busy Chapel Street. A hidden sanctuary calmly grows a relationship and charm to tree, wild life and people. The Living Bridge represents a natural reaction of living thing that not only response to a need of green corridor for local commuter from Peel Park to Chapel Street but also emphasises the idea of “Natural Response” by Wildlife, People and Material that reaction is for a sustainable growth of the meadow, the city and the people. The Living Bridge’s facade and fragmented columns’ rain screen encourage wildlife to habit inside. It is controlled opening to a specific diameter and is placed on different height in order to response a wildlife habitat preference. Subtle landmark of fragment columns gesture pedestrian and cyclist discreetly a way to the bridge. Simple form of the bridge and its structure is designed to be an underline of environment. It lets commuter embrace a scenery of the Meadow and the River Irwell. Through time, carved oak panels react to chemical substance from surrounding express a sense of age. The carved random diagonal pattern and the oak smooth surface cast shadow on its surface adding another dimension to whole facade which give a glimpse of living thing. Most landscape area is left deliberately untouched. Only a fragmented columns and benches scatter around a landing area and underneath the bridge on the meadow to expose a visitor to the natural environment. Architect: pruthiphon buakaew Co., Ltd. Ambitious architects could gain an international reputation with the launch of a competition to design a new pedestrian bridge for Salford. The competition is open to registered architects and engineers worldwide. Team collaborations are encouraged and can either be architect or engineering led. The area where the bridge is set to be constructed – The Meadows – covers around seven hectares and forms the northern section of the Irwell River Park (IRP) project. The IRP project has already enjoyed a £660 million public and private sector investment. The Judging Panel includes Renato Benedetti, McDowell + Benedetti acting as the RIBA Adviser, and the City Mayor of Salford. The closing date for Stage 1 submissions is 5 September 2013.